Caneel Bay Resort is the first name in hospitality in St.John. 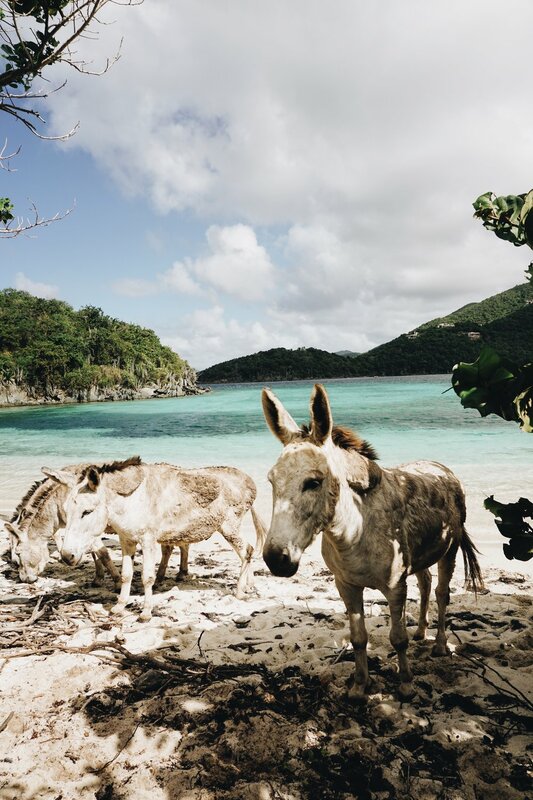 The beachfront property boasts gorgeous, white sand beaches and a wandering herd of wild donkeys who call Caneel Bay home. You’ll arrive to the property via private ferry, but don’t let that stop you from booking a sunset sail (complete with appetizers and cocktails, of course). A massage in an oceanfront cabana makes for a truly relaxing experience. Estate Concordia is a little off-the-grid with sweeping views of the Caribbean Sea. The rooms here are rustic and charming with solar panels lining the roof. Yoga classes are offered and the on-site restaurant has an incredible view. The Longboard in Cruz Bay is a great spot; their cocktail list is long and inventive (try the Heart & Sol for a quirky take on a margarita). The food here skews towards fusion with a slightly Asian influence. The ceviche and spring rolls were memorable. Tip: Come for happy hour when the dangerously delicious cocktails are $6. Zozo’s at Caneel Bay is housed in a renovated sugar mill, set on a hill with some stunning views of the bay. Tip: Book a table at sunset near the window. Miss Lucy's has a waterfront location and a delicious jazz brunch; try the poached eggs with sweet potato hash…and ask for some local hot sauce! Turtle Bay Estate House at Caneel Bay is best reserved for a special occasion dinner; the service here is warm and genuine. Colombo’s for fresh fruit smoothies. Tip: Add a shot of light rum to any drink…on the house. You're on vacation! Peace Hill is a quick hike and offers views of Perkins Cay. 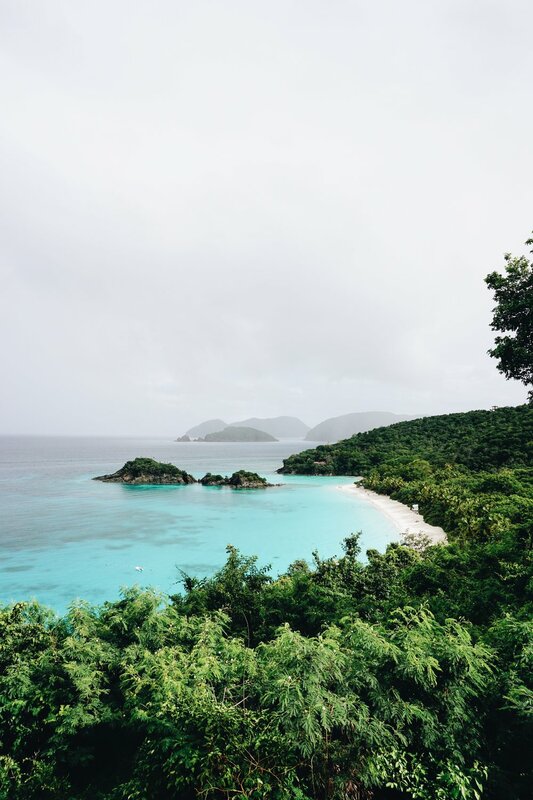 Trunk Bay is a part of the national park system and requires an entry fee of $5.00, but it’s worth it. You’d be hard pressed to find a nicer beach on the island, let alone the planet. Tip: There’s a small snack bar selling concessions, but coolers are allowed. Pack a picnic and stay for the day! St. John is all about sailing. Kalina Charters offer sunset sails and day sails (with stops at snorkeling spots). If you’re keen to explore the island, renting a Jeep is a must. St. John is small, but points of interest are spread out. Otherwise, there are open air taxis that stop at some of the more frequented spots. My go-to vacation accessory? 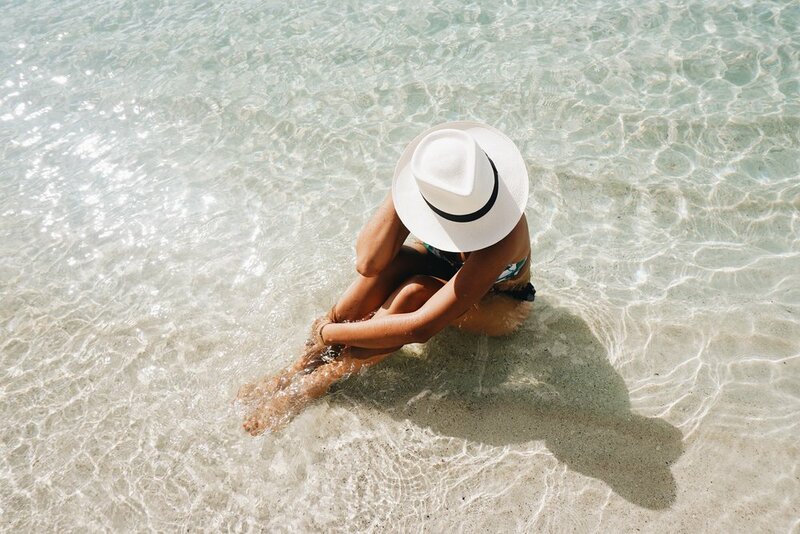 This panama hat. There is no airport on St. John, so getting here requires a stopover in St.Thomas and a ferry ride. Also, cell service here can be spotty; try to relax, and just remember…you’re on Island Time!